Benjamin Joseph Manaly Novak (born July 31, 1979) is an American actor, writer, comedian, and director. Novak was one of the writers and executive producers of The Office (2005–2013), in which he also played Ryan Howard. Novak was born July 31, 1979 in Newton, Massachusetts. His parents are Linda (née Manaly) and author William Novak. Novak's family is Jewish. His father co-edited The Big Book of Jewish Humor, and has ghostwritten memoirs for Nancy Reagan, Lee Iacocca, Magic Johnson, and others; his parents also established a Jewish matchmaking service. Novak has two younger brothers, Jesse, a composer, and Lev. He attended Solomon Schechter Day School of Greater Boston for elementary school and middle school. He attended Newton South High School with future The Office costar John Krasinski, and they graduated in 1997. Novak graduated from Harvard University in 2001, where he was a member of the Harvard Lampoon and the Hasty Pudding Club. He majored in English and Spanish literature, and wrote his honors thesis on the films of Shakespeare's Hamlet. Aside from the Lampoon, he occasionally staged and performed in a variety show called The B.J. Show with fellow Harvard student B. J. Averell. Following his graduation from Harvard, he moved to Los Angeles, California and began working in clubs as a comedian. His first live stand-up performance took place at the Hollywood Youth Hostel on October 10, 2001. 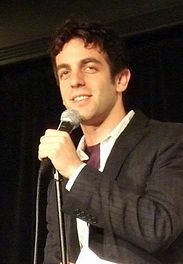 He was named one of Variety's "Ten Comedians To Watch" in 2003. Novak was a writer for the short-lived The WB sitcom Raising Dad. He performed on Comedy Central's Premium Blend and on Late Night with Conan O'Brien. Novak's television acting career began on MTV's Punk'd. He was the lead accomplice to Ashton Kutcher on the show's second season in 2003, playing pranks on Hilary Duff, Rachael Leigh Cook, Usher, and Mýa. 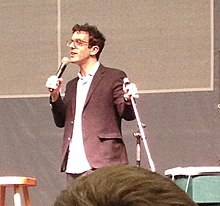 After hearing Novak's opening joke at a comedy club, executive producer Greg Daniels decided he "wanted to do something with him"; Novak was subsequently cast as Ryan Howard. Novak was not only a cast member on the show but a producer and writer. He along with Mindy Kaling, Greg Daniels, Michael Schur, and Paul Lieberstein were the original writers for the show. He is credited with writing fifteen episodes during the show's duration including the Writer's Guild of America nominated episodes "Diversity Day" and "Local Ad". "Sometimes when this feels too good to be true, I think that if this were all a dream, that would be what should have tipped me off. I'd wake up saying, "I was in this incredible TV show and it was a big hit and the star was John [Krasinski] from high school. Isn't that weird?" Novak has appeared in the films Unaccompanied Minors, Reign Over Me, The Internship, Knocked Up, The Smurfs, and The Amazing Spider-Man 2. He has had supporting roles in Quentin Tarantino's Inglourious Basterds (2009), John Lee Hancock's Saving Mr. Banks (2013), and The Founder (2016). He has starred in episodes of The Mindy Project, The Newsroom, Community, and Crazy Ex-Girlfriend. On April 11, 2013, publishing house Alfred A. Knopf announced it had signed a seven-figure, two-book deal with Novak, with the first book slated to be a fictional collection of Woody Allen-like stories. On February 4, 2014 a book of 22 stories, One More Thing: Stories and Other Stories, was published and spent 6 weeks on the NYT Hardcover Fiction Bestsellers List. Novak also signed a deal with Penguin's children's books label and wrote The Book With No Pictures, which was released in September 2014 and has spent four full years on the New York Times Picture Books list, with 34 weeks charting as the #1 seller in the United States. In May 2015, it was announced that Novak and Mindy Kaling had signed a book deal worth a reported $7.5 million to write about their long friendship and former relationship, though Kaling said in an interview that the book would "not be a tell-all." On October 14, 2015 Novak released an Apple iOS app along with co-founder Dev Flaherty called The List App. The app has since been nominated for a Webby Award (losing in its category to Beme and Pocket) and in May 2016 rebranded as 'li.st' and became available on the Android platform. In September 2017, the app was shut down, citing that the growth wasn't enough to sustain the current product. Novak has a close friendship with Mindy Kaling, whom he met through writing for The Office. The two dated on and off while writing and acting on the show, sometimes mirroring the on-again, off-again nature of the relationship between their respective characters Ryan Howard and Kelly Kapoor. 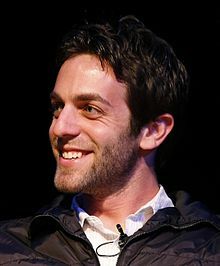 He served as a consulting producer for Season 1 of The Mindy Project, and has appeared on the show several times, though his formal producing role ended after the first season. His brother Jesse composed the music for The Mindy Project and BoJack Horseman. Novak, B. J. (2014). The book with no pictures. — (2014). One more thing : stories and other stories. Novak, B. J. (2017). The alphabet book with no pictures. Novak, B. J. (November 4, 2013). "The man who invented the calendar". Shouts & Murmurs. The New Yorker. 89 (35): 64–65. "Pants" on Current Mood with John Mayer. Aired: 2/17/19. ^ Hoys, Matt; Brooks, Mel (2013). Comic Genius: Portraits of Funny People. Chronicle Books. p. 194. ISBN 1452131953. ^ "B.J. Novak". TV Guide. ^ Courtney Hollands (20 December 2007). "Molly Goodson has stars in her eyes - and on her blog". The Boston Globe. Retrieved 6 March 2009. ^ Berman, Alyssa R.; Beborah B. Doroshow (14 May 2001). "BJs Bring a Full House to Sanders". Harvard Crimson. Retrieved 19 August 2009. ^ Novak, William (2006). The Big Book of Jewish Humor. Collins. p. vii. ISBN 0-06-113813-4. ^ Getlin, John (17 September 1992). "Ghost to the Stars - William Novak Is the Invisible Writer Behind Memoirs by Lee Iacocca, Nancy Reagan and--Soon--Magic Johnson". Los Angeles Times. Retrieved 19 August 2009. ^ Uriel Heilman (November 19, 2006). "Better than Pork, Isn't it? Jewish Joke Book turns 25". JTA. Archived from the original on 4 September 2009. Retrieved 13 March 2009. ^ "Class Notes-Solomon Schechter Day School". www.ssdsboston.org. Retrieved 21 January 2016. ^ a b c d e f Christopher Muther (December 6, 2005). "Class reunion". The Boston Globe. Archived from the original on February 24, 2009. Retrieved 6 March 2009. ^ a b "B.J. Novak: Videos, Jokes, Tour Dates, Biography and more". Jokes.com. ComedyCentral. 2009. Archived from the original on October 20, 2008. Retrieved 11 March 2009. ^ David Hiltbrand, "B.J. Novak gives at 'The Office' and out of it", Philadelphia Inquirer, June 11, 2009. ^ Julie Bosman, "B.J. Novak, Actor and Writer, Signs Two-Book Deal", nytimes.com, April 12, 2013; accessed September 21, 2013. ^ "Best Sellers". The New York Times. 30 March 2014. Retrieved 30 November 2014. ^ Towers, Andrea (22 January 2014). "On the Books: B.J. Novak lands children's book deal". Entertainment Weekly. Retrieved 30 November 2014. ^ "B.J. Novak introduces new app for people who 'just love lists'". EW.com. Retrieved 2018-01-13. ^ Perez, Sarah. "B.J. Novak's "The List App" rebrands to li.st, arrives on Android". TechCrunch. Retrieved 2018-01-13. ^ "List App Shuts Down App, Moves On To New Project". Commaful. ^ "35 Times Mindy Kaling And B.J. Novak's Best Friendship Killed You In The Heart". ^ "B.J. Novak on his 'Mindy Project' arc, being BFF with Mindy Kaling, and returning to 'The Office'", ohnotheydidnt.livejournal.com, January 29, 2013. ^ Andrew Krukowski, "'Sopranos,' 'The Office' Win SAG Ensemble Awards," TVWeek, January 27, 2008. This page is based on the Wikipedia article B. J. Novak; it is used under the Creative Commons Attribution-ShareAlike 3.0 Unported License (CC-BY-SA). You may redistribute it, verbatim or modified, providing that you comply with the terms of the CC-BY-SA.